1.) On February 23, 2008, Jesse Heap of Pink Cake Box left a comment on this blog. We had a short conversation in the comments of that post. About two weeks later, I sent Jesse an email telling him I wanted to profile his wife’s bakery and the way they were using new “Web 2.0” marketing tools for one of my Search Engine Land columns. 2.) On March 13, the column appeared on SEL: A Small Business Marketing Success Story: Pink Cake Box. It was the first in a series of columns I did profiling small business success stories. 3.) In September, I did an interview with a writer from Business Asset, a quarterly magazine focused on small businesses. They share content with Inc. Magazine, too. After asking me a bunch of questions, the writer asked if I knew of any small business owners who were successfully using social media and other online tools to grow their business. I gave the writer the names and contact information of several businesses that I had profiled on SEL, including Jesse and Pink Cake Box. 4.) 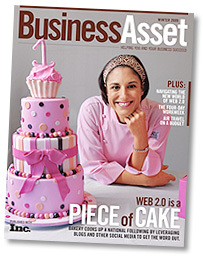 Business Asset just put Pink Cake Box on the cover of their Winter 2009 issue (photo above) with a nice two-page article inside with quotes from Jesse’s wife, Anne. How’s that for some nice exposure? It’s all thanks to a single blog comment. Now, don’t get me wrong — I’m not taking credit for this or patting myself on the back. Pink Cake Box is doing an awesome job of marketing without any help from me; they’ve been on the Rachel Ray show, Food Network, CNN Headline News, and countless magazines. No, the point is simple: Sometimes you never know what will happen when you start reading blogs, leaving quality comments on blogs, and making a connection with blog authors. You can read the Pink Cake Box article here — click CONTENTS at the top and choose the article that starts on page 6. I should also note that John Tuggle of Learning Guitar Now and St. Paul real estate agent Teresa Boardman both appear in the article that starts on page 8. They’re two more small biz owners that I profiled on SEL last year (John and Teresa) and recommended to the magazine writer. I didn’t learn about them from blog comments, but via word-of-mouth from a mutual friend (John) and my wife (who knew of Teresa from real estate blogging). A-ha! So that’s the connection. Matt, I was wondering how Business Asset knew about all these folks you’ve written about. You did an interview with them. Very cool. Clearly, Business Asset knows a good thing when they see it. I think you deserve a pat on the back, Matt, and so do each of these smart small business owners. That is the greatest reward for getting out there and participating in the conversation. We know it happens more frequently than we realize. Very cool to see how it all came together and what part you played. Awesome Matt! That is a great success story Matt. Leaving thoughtful blog comments is the whole point of web 2.0, yet so many people feel compelled to spam or not to comment at all. While I don’t have any stories that can top your, I can say that I have made some really good friends and connections by leaving and responding to blog comments. Seriously though, great cast study Matt! Well done indeed. Despite your humble protests this happened because of your work. The fact that small businesses are reading your blog attests to that. You’ve done a fantastic job of carving out a niche and working it well. Okay enough kissing up, I’ve made my comment now can I see an article about me in Forbes? I just got back to reading and commenting on blogs I had enjoyed in the past year after being “too busy” for that kind of stuff. You know what happened? I got too self focused. My world got smaller and smaller and my thinking got more and more stale. I got to thinking about how good things always seemed to happen when I was regularly reading and posting to other people’s blogs. No, nothing as dramatic as what happened to Jesse. But reading interesting ideas, meeting interesting people, and expanding my mind with other people’s insights. Not to mention the stray curious people who wandered into my site and (hopefully) found something to help them there. Blog reading and blog commenting is worth the time, whether anything dramatic happens or not. It’s working fine for me in Safari, but if you want to send me a screenshot of what you see, that might help. Thx. I know I am really late on this one, but I would still like to throw in my 2 cents. The series of events that occured all because of, at root, one blog comment are amazing. I really enjoyed this article, I am not much of a blogger myself but I do like reading about these, for lack of a better phrase, viral situations. I am curious to hear how her sales and business were affected by the press she has recieved from this. It would be difficult to figure out but it would be really cool to see something like that in real world dollars and cents. Just stumbled across your website today. I am starting with your My Best Posts category (I love that idea) and working my way through them. I am newbie still when it comes to blogging, but I have already discovered great blogs that I would have probably never known about just by following someone who leaves a great comment. As this post shows, you just never know what a single comment will do long after you forget you even left it. I’m also a newbie in blogging and i can say that commenting is fun and it gives you a moment to interact with people. Great thing i came across your blog today! Very good example of what comes about when you engage in online conversations and actually contribute to the discussion. Thanks for sharing! Small businesses often don’t have much more than their own determination so low cost marketing approaches such as engaging in online conversations is a great way to go. Correct me if I’m wrong Matt, but it was probably Jesse’s sincerity that made her stick out in your mind. Quality comments and contributions are the way to go, add value when you can and you will be surprised what it will bring you.